The Fredericton shooting that left four people dead Friday, including two police officers and two civilians, has brought back painful memories of the fatal Moncton Mountie shootings four years ago and has raised some similar questions about officer safety. 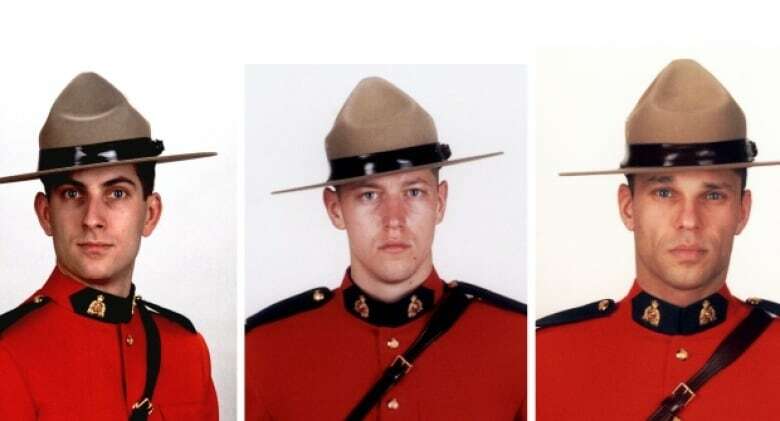 The Fredericton shooting that left four people dead on Friday, including two municipal police officers and two civilians, has brought back painful memories for many New Brunswickers of the fatal shooting of three Moncton Mounties four years ago. It's not yet clear whether there are any similarities between the cases, but some of the same questions about officer safety asked in 2014 have resurfaced. 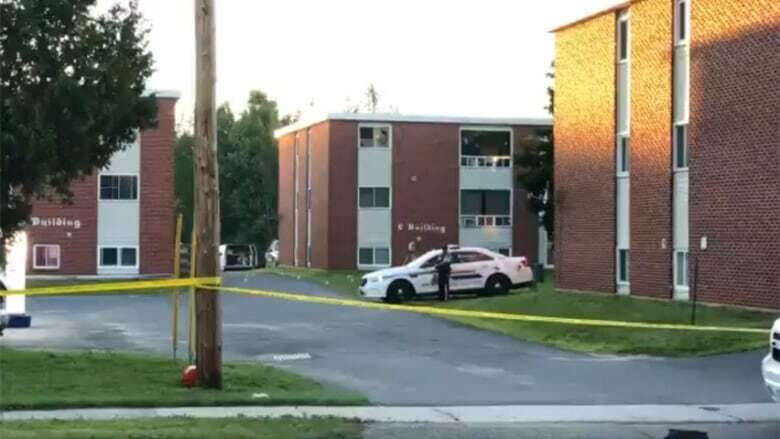 Fredericton Police Force officers Lawrence Robert Costello, 45, and Sara Mae Helen Burns, 43, were gunned down as they approached two civilians who were lying on the ground. The officers were the first on the scene, responding to reports of gunfire at an apartment complex on the 200 block of Brookside Drive in the city's north end at 7:10 a.m. AT. Donnie Robichaud, 42, a local bass player, was identified as the male civilian victim. The female civilian killed was identified Saturday as Bobbie Lee Wright, 32. 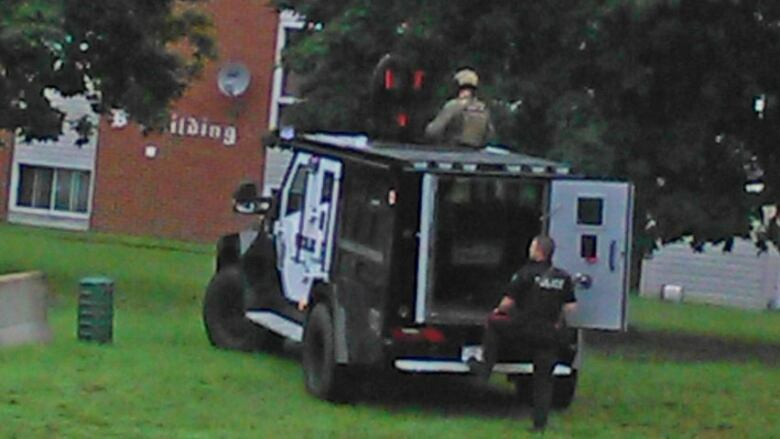 The suspect, Matthew Vincent Raymond, 48, was taken to hospital with serious injuries. Few other details have been released about what prompted Friday's shooting. 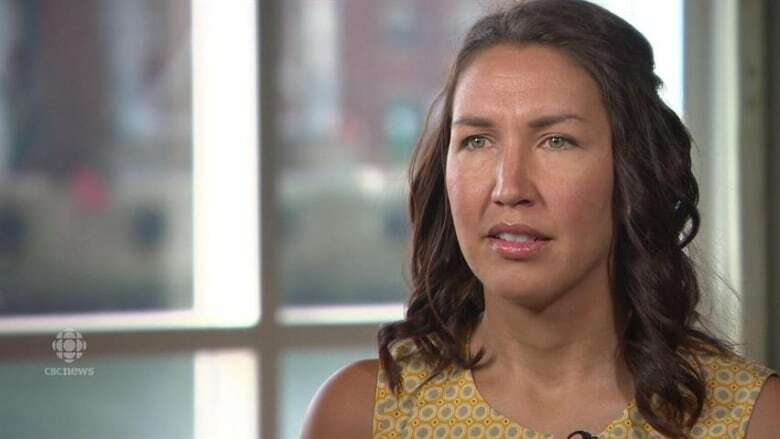 The widow of one of the Moncton Mounties who was slain says she believes "there are serious safety concerns that need and deserve immediate attention." Angela Gevaudan's husband, Codiac Regional RCMP Const. Fabrice Gevaudan, 45, was killed along with constables Doug Larche, 40, and Dave Ross, 32, in a shooting rampage by Justin Bourque in a residential neighbourhood on June 4, 2014. Constables Eric Dubois and Darlene Goguen were wounded. "It's normal for people to have associations to what happened here on June 4, and for the memories to surface," said Gevaudan. She declined to discuss her own reaction to the Fredericton shooting, saying she wants to keep the "focus on those who are directly impacted by this incident." "My heart is with their families and loved ones and anyone in uniform." Gevaudan has previously been outspoken about the need to train Mounties and give them the proper weapons to deal with the situations they might face. Earlier this year, the RCMP was ordered to pay penalties totalling $550,000 for failing under the Canada Labour Code to provide adequate equipment and training to the Mounties who were killed or wounded trying to stop Bourque. Tom Stamatakis, president of the Canadian Police Association, said officers across the country receive a "significant" amount of training and "the right" equipment to respond to shooting incidents. "But the reality is you can never be completely prepared." Officers often respond to incidents, where they know very little about what they're getting into and have little or no control over the environment, he said. Another challenge for officers — and all first responders — is when they arrive at a scene and someone is injured, their instinctive reaction is to go in and try to help. "Unfortunately, often when you do, that means that that's when you expose yourself to more risk." In the Moncton shooting, Bourque targeted police officers in hopes of starting a rebellion. He pleaded guilty to three counts of first-degree murder and two counts of attempted murder. He was sentenced to life in prison with no eligibility of parole for 75 years, which is the longest period of parole ineligibility in Canadian history. Stamatakis said he suspects the slain Fredericton officers, much like the Moncton ones, never anticipated they would be involved in an incident that would result in the loss of their lives. "They don't expect — in Canada, at least — that, you know, they're not going to make it home, or whatever they're responding to is going to turn into a tragedy." Since 1975, a total of 284 police officers have died on the job, according to the Canadian and Peace Officers Memorial database. Of that number, 101 were homicide victims, 83 per cent of whom were killed with a firearm. A Statistics Canada study released in 2010 found about 80 per cent of officers who died in shootings were not wearing bulletproof vests, although the trend has decreased significantly since the mid-1980s. The same study found most officers were attacked by surprise — only a third had the chance to draw their gun or fire a shot before being killed. Last month, the Fredericton Police Force announced six officers would start wearing body cameras, following a successful pilot project. Enhance transparency, public trust and confidence. Enhance officer accountability and professionalism. Protect officers from unfounded allegations of misconduct. The cameras are not turned on all the time. Officers are supposed to activate the cameras when responding to a call or when they "come across an incident requiring investigation," Deputy Chief Martin Gaudet has said. In April, the force faced criticism for investing more than $340,000 in an armoured rescue vehicle. "The ARV is about protection and prevention," the city said in a statement at the time. As we grieve for our colleagues and the other victims, we know you are grieving with us. Make sure to look after one another. And if you are having a difficult time, make sure you reach out and talk to someone. You are not alone. "It will be able to support our officers on calls related to weapons, allowing police to safely evacuate citizens from an area of concern, and provide much needed protection to officers entering into hazardous situations." The vehicle is being leased for six years, at a cost of about $57,000 a year, after which the city will own it. 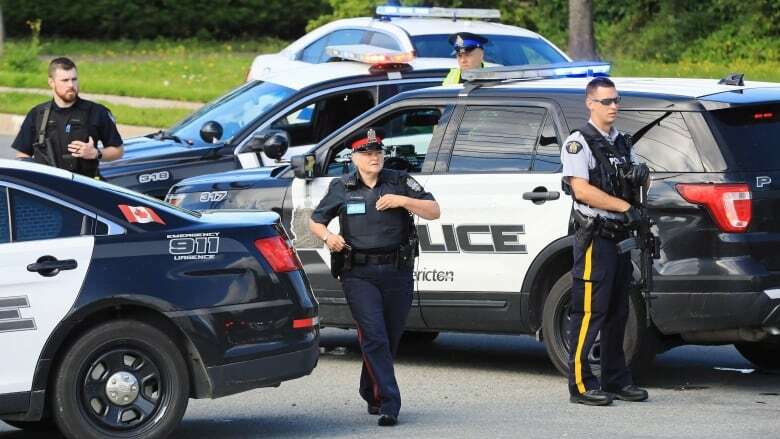 The Fredericton Police Force's emergency response team (ERT) is one of only four fully operational teams in the province. It serves the city and other New Brunswick jurisdictions on an as-needed basis. New Brunswick RCMP are handling the Fredericton homicide investigation and are seeking the public's assistance. Anyone with photos or videos related to the fatal shooting is asked to upload them anonymously. Officers continued to guard the crime scene into Friday evening. An area measuring three city blocks by two city blocks around the low-rise, red-brick apartment complex was cordoned off with yellow caution police tape and blocked by police vehicles. One of the buildings, at 237 Brookside Dr., was evacuated shortly before 9 a.m. Friday and the area from Main Street to Ring Road was under lockdown for about four hours until around 11 a.m. People were urged to avoid the area and residents were told to stay inside. The Canadian Red Cross helped provide emergency shelter overnight to some of the evacuees who haven't been able to return to their homes yet. Police have to finish their investigation first, said provincial director Bill Lawlor. "They want to make sure that that area is secure until they are completely finished and then it will be appropriate for folks to return home," he said. At the height of evacuation, 70 people gathered at Willie O'Ree Place reception centre, wondering where they were going to spend the night. Joseph Cartwright, his partner and young child were among them. "They wouldn't let us get our cats, they wouldn't let us get our cars, our clothes nothing," he said. Lawlor said the organization would find hotel accommodations for those who needed it, but people were being encouraging to stay with family or friends, if possible. "Just given the nature of what took place today, it's the advice of victim services that it's perhaps best not to be alone," he said. A GoFundMe campaign has been launched for the families of the four victims. "Monetary assistance will never heal all wounds, however, it will help with the expenses that are incurred with devastating losses such as these," the Fredericton Shooting - Family Fund page states. Nearly $1,000 was raised within the first 12 hours. The goal is $12,000.